Nissan Micra is a mid segment small hatchback car from Nissan Motor India. The car would be launched with both petrol and diesel options. It is a five seater car with various advanced security and comfort features. The car would be launched soon in India. Appearance: The front side of the car consists of strong grille and broad headlamps along with Tinted Head lamp covers. Sporty bumpers and Alloy wheels give the car a sturdy look. Body colored door mirrors add to the elegance. Comfort: The car was several comfort features. It is ultra spacious. Nissan Micra has Comfortable Seats, Adjustable Headrests, Front Map Reading Light, Driver and Passenger Vanity Mirror, Climate Control AC, Interior Fuel Flap Control, Passenger Side Front and Rear Grab Handles, Rear Sliding Seat, Take away Convenience Hook. The car is packed with advanced integrated audio system with Aux- in support. The car is fitted with Leather Upholstery, Front and Rear Cup Holders, Front and Rear Door Pockets, Tachometer and a Digital Clock. Safety: Nissan Micra has Dual Front Airbags, Front Seat belt with Height Adjustment, Three Point ELR Seat Belts, Driver Seat Belt Reminder, Front Fog Lamps, Halogen Headlamps, Central Locking, Child Safety Locks, ABS (Antilock Brake System) with Brake Assist (BA), EBD (Electronic Brake-Force Distribution) and Speed Sensitive Power Assisted Steering. Engine: The Petrol Variant is powered by 1.2 L, 1240 cc engine with MPFI fuel injection system which produces 80 PS power at 5200 rpm with 110 Nm torque at 3600 rpm. There might be another engine also, which would be 1.4 L, 1386 cc petrol engine with MPFI fuel injection system which can produce 88 PS power at 5200 rpm and a torque of 128 Nm at 3200 rpm. Both engines would be available with automatic transmission gearbox. The Diesel Variant would be powered by 1.5 L, 1461 cc, CRDI diesel engine with five speed manual transmission gear box that churns 86 PS of power at 3750 rpm with 200 Nm torque at 1900 rpm. 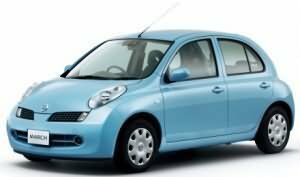 Price: Nissan Micra is priced at Rs. 4,00,000. The price specified is taking Mumbai as base price location. It is an approximate price which excludes tax, registration, insurance and cost of accessories. well i happy 2 see that nissan micra come with automatic transmission gearbox.i have one with at gearbox i want to try this .how good is this. and better then hunadai i10. I feel Ritz is a better car than Micra because, its powered by K series engine. Also, Micra is not so nice on the interiors, cheap plastic quality and not so attractive dash. Whereas, Ritz has got durable plastics and practical positioning of switches and buttons. Also, Ritz has comfortable seats too. Maruti’s service is satisfactory,but we don’t know about Nissan. Anyways, I am going for Ritz, its the best hatchback!